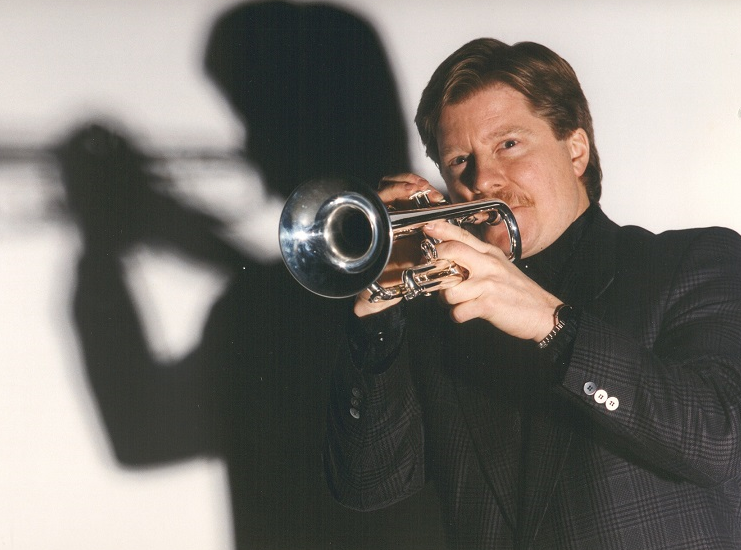 Free lance and Lead trumpet player Mike Ponella of New York, New York has toured and performed with the Toshiko Akiyoshi Jazz Orchestra as well as with the United Nations Jazz Orchestra under the direction of Paquito D'Rivera in recent years. Mike Ponella graduated from The New England Conservatory of Music. Mike is a brass embouchure clinician as well as a jazz ensemble clinician offering a wide variety of services to both individuals as well as groups of students. Mike recently finished brass master classes and jazz ensemble clinics in Japan and has been invited to return soon due to their overwhelming success. Free lance Trumpet Player Mike Ponella has performed in hundreds of varying musical situations from big band to orchestral. Mike is a stellar Lead player and a veteran of the world renown Toshiko Akiyoshi Jazz Orchestra ... widely considered a very difficult lead book. Mike has also performed with Freddie Hubbard, Doc Severinsen, Ed Schaunessey, Ross Tompkins, Rosemary Clooney, Tony Bennett, Jon Faddis, Lew Tabackin, Randy Brecker, John Pizzarelli, Bucky Pizzarelli, Spike Robinson, Paquito D'Rivera, Joan Rivers, Joel Grey, Billy Taylor, Johnny Mathis, Gerry Mulligan, Englebert Humperdinck, Bill Finegan, Al Martino, The Temptations, The 4 Tops, Shirley Jones, Peter Appleyard, George Burns, Jimmy Heath, Joe Williams, Paul Jeffries, Jaki Byard, Gil Evans, Bob Brookmeyer, Anthony Braxton, Skitch Henderson, Clark Terry, Dizzy Gillespie, Eddie Daniels Frankie Valli, Tommy Tune, The Spinners, Peggy March, Lou Christie, Lesley Gore, Bobby Rydell, David Amram, Dave Brubeck, Jerry Vale, Chick Corea, Louis Bellson, Aretha Franklin. Grethen Wilder, Lee Konitz, Tess Marsalis, Slide Hampton, Milt Jackson, Harry Blackstone Jr., Connie Francis, Don Rickles, Sal Richards, Scott Record, Buddy Greco, Michael Amante, Dave Liebman, Harry Connick Sr., James Darren, Bob Newhart, Joe Piscopo, Glenn Campbell, Lorna Luft, Paul Zim, Regis Philbin, Kathy Lee Gifford. Gianni Russo, Donna Summer, Petula Clark, Burt Bacharach, Dionne Warwick, Bobby Vinton, Duprees, Frank Stallone, Frank Sinatra Jr., Tony Orlando, Jack Carter, Clarence "Gatemouth" Brown, Keely Smith, Steve Lippia. Jay Black and the Americans. The Golden Boys. Clay Aiken. "Red" Hurley. Gladys Knight. Chaka Khan. Patti LaBelle. Diana Ross. Bernadette Peters. Chris Botti, Wynton Marsalis, Josh Groban, and Tom Wopat. Mike's Big Band experience includes Toshiko Akiyoshi's Jazz Orchestra; the United Nation Orchestra with Paquito D'Rivera; Slide Hampton and The Jazz Masters; The Count Basie Orchestra; Chico O'Farrill; Harry Connick Jr; Vince Giordano and The Nighthawks; Sonny Costanzo; Lew Anderson; Bob Alexander; Tom Pierson; Wayne Andre; George Russell; Mark Masters; Xavier Cugat; Nelson Riddle; Guy Lombardo; NewYorkestra; Birdland Big Band; Hartford Jazz Orchestra; Tito Puente; and the Palladium Orchestra.